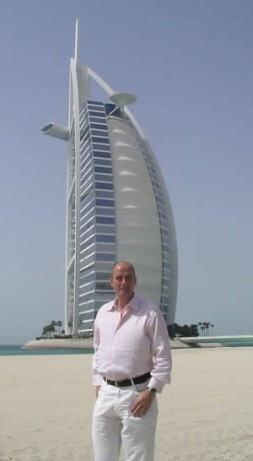 Dr. Hubertus Hoffmann, President of the World Security Network Foundation in front of the Burj Al Arab hotel in Dubai, the peaceful lighthouse on the Gulf:"All of us - Muslims, Jews and Christians - need an Islamic Renaissance now! The Islamic world needs a renaissance of its true values, in particular of those things worth knowing when it was strong, powerful, and even dominant. Only in this way, can it arrive at its true self and at the heart of the message of the Koran." All too easily, the modern "media-man" encounters a one-sided, unreal, distorted and thereby unrealistic picture of the world, full of negative images and news, which the cameramen of CNN and their TV colleagues seem magically drawn to—the world as an ongoing action/horror movie—blood and thunder sent live daily into the living room. War and terror sell well. It is certainly more thrilling to show U.S. soldiers raiding homes in Iraq or the hunt for terrorists in London than the positive examples of the cooperation between Christians, Jews and Muslims. But let’s be honest: that is only a part of the world today. And the consuming flames are fanned still further. Without continuous TV reports, Osama bin Laden and his supporters in Iraq wouldn’t be half as influential and dangerous. With that in mind, I recently acquired my own impressions in the Gulf States of Dubai and Oman, and can announce to our readers: there are positive developments in the Gulf region, there is hope for peaceful cooperation, and there are approaches for better politics. Sheikh Nahayan Mabarak Al Nahayan, Minister of Education of the United Arab Emirates, is right to demand that Islam must not position itself as a threat of the Western way-of-life, and that stereotypes and ignorance must be overcome on both sides. The Islamic states will have to reform themselves, as only then there is a realistic hope for a better future. With that, the development of public opinion through leadership and vision must also be counted. 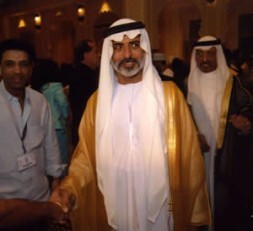 Dubai did not only talk, it acted. It has become a boomtown on the Gulf—dynamic, multicultural, open—a mix of the Oriental and modern Western culture, a shinning example for its neighbors such as Saudi Arabia and even Iraq. Dubai will accomplish its goals, becoming a peaceful lighthouse on the gulf, symbolized by the sailboat-like hotel (like something from the set of a James Bond film), Burj Al Arab. All of us—Muslims, Jews and Christians—need an Islamic Renaissance now! We must go to the roots of the problem, not to the leaves of the tree upon which the terrorists grow. The Human Development Report of the UNDP 2002 contains the clear analysis: the Islamic countries suffer from a lack of knowledge, lack of freedom, and a lack of women’s rights. It is not primarily a question of a U.S.-style democratization through the deposition of the all too many self-complacent potentates. This policy would unfortunately, as with the totalitarian dictator Adolf Hitler in a frustrated Germany of 1933, only serve to usher the radicals into power through elections and replace a bad regime with an even worse one (as in Iran), rather than genuine fundamental structural politics. The Islamic countries spend far too little on education, and are therefore not internationally competitive. The infrastructure is generally still too weak. For example, the average density of telephone connections is only 20%. At one time, however, Islam was the leading political power, the leader in knowledge and innovation of the entire world. Islam dominated the world of the knowledge in North Africa, Europe and central Asia up to the 13th Century. At that time, one invested in knowledge and integrated cosmopolitan elements from India, Greece and Italy with the knowledge of Mesopotamia. Islam was not turned inward on itself, but looked toward the outside. Those of different faiths within its territory—as with, for example, Christians and Jews over centuries on the Iberian Peninsula—were neither killed by suicide bombers as in Israel, nor behead. On the contrary, they were tolerated and viewed as an enrichment. A high degree of tolerance for Christians and Jews prevailed, with freedom of speech and opinion. One learned from those of other faiths and as a result became the world leader in science and research. Caliph al-Hakara of Andalusia had, for example, 500,000 books in his library. U.S. President Jefferson settled for 500. Moslem rulers of the time put a priority on the search for foreign teachers. The great Greek philosophers Aristotle and Plato were translated very early on into Arabic. One purposefully built centers of excellence and put a priority on elite education. In the years 750–1,100 CE, knowledge exploded in the Islamic world in the areas of mathematics, medicine, astrology, optics, botany, and navigation. At the time, the Islamic world was as dominant in the area of knowledge as the U.S.A. is today. Paper was invented in 751 CE in Islamic countries, and only in 1276 in Europe. Also glass, mechanical clocks and crop rotation in agriculture appeared in Europe much later. Sheikh Nahayan Mabarak Al Nahayan, Minister of Education of the United Arab Emirates: "Islam must not position itself as a threat of the Western way-of-life, and stereotypes and ignorance must be overcome on both sides. The Islamic states will have to reform themselves, as only then there is a realistic hope for a better future." In the early Middle Ages, Europe was ruled by darkness, the period of the Inquisitions and the burning of witches. Today, things are exactly the opposite. Why? Europe freed itself from the dictatorship of church ideology. Enlightenment became the catalyst of the superiority of the West. The Islamic countries will be only become more prosperous after they have also gone this route. The example of Saudi Arabia, a breeding-ground for terrorists, shows clearly that the idea of a stable state based on an ultra-reactionary dictatorship of overzealous clerics is total nonsense and will ultimately bring down those that invented the system. Islam, through its own over-Islamization, is in effect strangling itself. In other words: knowledge, progress and prosperity can only exist when the people, economy and politics free themselves from the stranglehold of the Mullahs, when they expel them to their mosques and build up a plural and open society. The Arabian countries need tolerance; only then will they be as strong as they once were. It is a sign of embarrassing weakness that in some countries neither Christian churches nor symbols are allowed. Even the Prophet himself can not be pleased when murders and homicides are carried out in his name, as these are acts of insult to Allah, to the Koran itself, and to all Muslims. The Islamic world needs a renaissance of its true values, in particular of those things worth knowing when it was strong, powerful, and even dominant. Only in this way, can it arrive at its true self and at the heart of the message of the Koran. Arab Human Development Report 2004: "Towards Freedom in the Arab World"